Ernie Gygax and Benoist Poire have been working together for quite some time to bring a publishable form of the old Hobby Shop Dungeon to fruition. This is the D&D setting that Ernie would run since the mid/late 70s at the Dungeon Hobby Shop in Lake Geneva, WI. 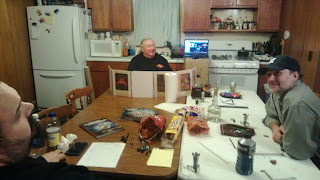 Ernie has been running freeform scenarios from this at various conventions and game stores and some of us have been lucky enough to participate in some playtesting of this storied setting locally. Follow me on Facebook and check out the photos there from time to time as I pictorially chronicle this ongoing effort and "Like" the Hobby Shop Dungeon Facebook page. See more here and here!